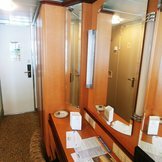 We chose this cruise, knowing it was an older ship with less amenities, because we wanted to enjoy a longer vacation and the 10 nights option called out to us. We ended up in a stateroom (#3606) with a great location to all the places we frequented the most (the gangway - deck 2, Reflections dining room - deck 4, Windjammer - deck 11, kids adventure club - deck 12, Centrum w/ music - enjoying music on all floors as we walked up or down the stairs, and the coffee shop - deck 5). The food was very good overall and service around the ship was also very good. Only downside was trying to get lounge chairs pool side. That was a challenge, but the couple of times we got lucky enough to get a chair, it was very nice. Also ping pong was great, but in a poor location (for those walking by! ), but it was under cover so the ping pong balls did not blow away :). I'd also recommend the sushi making class, that was very enjoyable and you got to eat your creations, which were delicious. Kids club was a hit for our children (ages 9 & 11) and they were able to check themselves in and out, they loved the responsibility! Side note: Royal App needs a lot of work. It's a gret idea, but don't rely on it for booking excursions or having all correct info. After 20+ cruises, this was one of our favorites. Enjoyed all the ports and ship was very nice. A great vacation! I appreciate Scott's knowledgeable advice. He was extremely helpful in selecting the cruise and the right stateroom. I have already contacted him for information on other cruises. This is our 7th cruise and definitely the most disappointing. It wasn’t bad, just the others were considerably better. 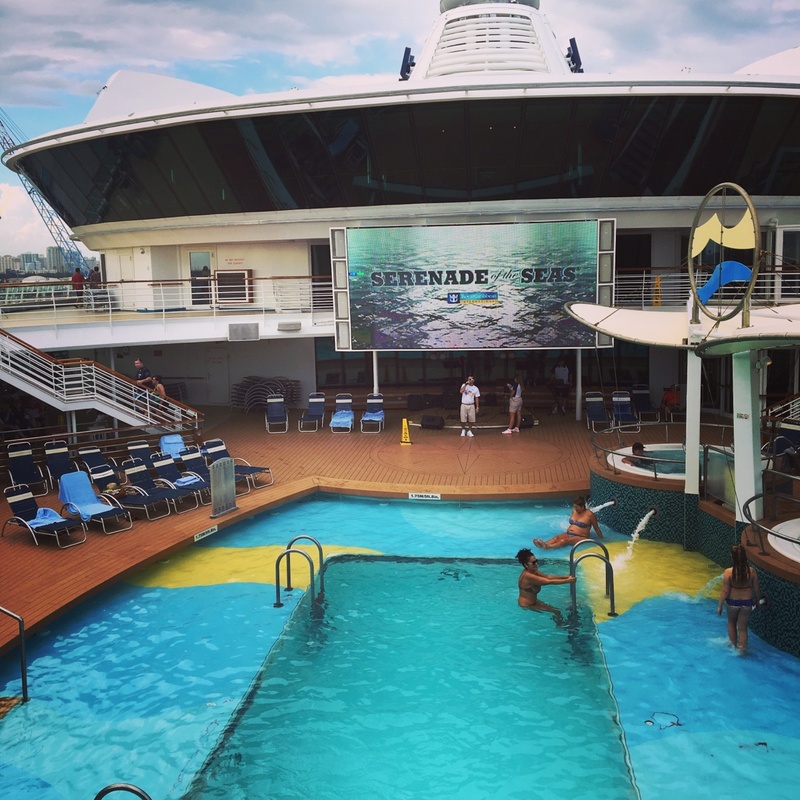 We have cruised on three different cruise lines all superior to Royal Caribbean. As mentioned there were only two electrical outlets in our cabin and the bathroom shelf fell down twice due to poor design. What was most disappointing was there was no real wine packages offered. On all the other cruise lines you could purchase 5-7 bottles of wine at various price levels starting at $120. Royal Caribbean offer 3 bottles of $10.00 wine for $117.00 or 5 for $250.00. No substitutions allowed! My $14.00 Old Fashioned was watered down and our server reeked of body odor. None of the bar staff would I rate as friendly. The entertainment at night was marginal compared to other cruises. Our $50.00 specialty dinner was marginal at best. To add insult to injury the disembarkation was painful. After spending about 30 minutes writing my review I see is giving my overall rating a 4.2. No way. I’d rate this cruise a 3. I can’t say I’ll never cruise with Royal Caribbean again but it certainly won’t be my first choice. A lot of fun. Great service. Easy to get around. Organized. How many times a day can you pitch the Vitality Spa?? It gets old! Love cruising. Now that we are Florida residents so much easier to get to ports. Royal Caribbean does a good job. We loved this cruise. Our days at sea were so relaxing, and we enjoyed every one of the ports. You could find a deck chair, order a pina colada, and sit back with your book to view the sea. It was just an outstanding 10 days!! We have cruised many times and we loved this one. Royal Caribbean takes such great care of passengers, the food was good, ports were lots of fun, there were amazing beaches to visit, and we made new friends. Although everything was not up to par, I would do it again. Great trip! Met many fun and interesting people. Most tours were excellent. One of the best stewards we have had. Entertainment was great. They need to improve their my time dining experience by being more flexible. This was my first cruise with Royal Caribbean, it was very enjoyable and I would cruise with them again. Overall this was a great cruise. Great ship, wonderful service and phenomenal food! Great overall time. Excursions were very informative. Weather was great. Love it. Royal Caribbean is our cruise company of choice. Only wish they would allow shorts in dining rooms at dinner on casual nights. We had planned my wife’s birthday for during this cruise and spent it in the Windjammer. Overall it was a good cruise. Our ports and excursions were amazing. We created many awesome memories. Outstanding itinerary, service and food easy to board, easy to get off ship. Excellent shopping in all islands. Numerous on board activities. Ship was renovated and on board appointments were admirable. reflections dinning room was excellent, windjammer was excellent. Enjoyed the solarium, casino, and the entertainment was great, particularly the commmedians, the productions shows. The ships band was awesome! Royal Caribbean does well to empower their staff to make the patrons happy. They seem to always have enough staff when they need it. You rarely wait for a drink over a couple minutes. The food is good and plenty. The rooms are very clean due to the hard work each day by your attendant. 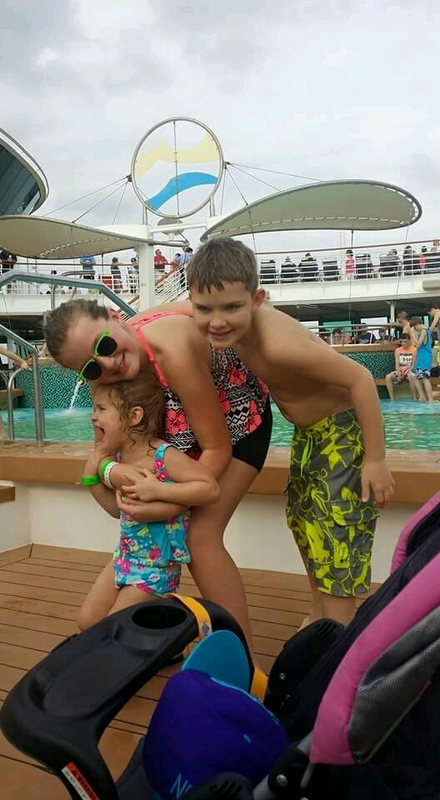 Two negatives of this ship-cruise, the kids pool was rarely open and the main pool video screen kept showing the same 3hour video loop the whole cruise. RC should have a DJ up there or put on music videos. The ship never really seemed crowded which is always nice. Loved it. Some of the best island to visit and the staff and service on the ship were was the best. Good itinerary, beautiful weather. Ship needs to be refurbished, and should have more customer service personnel on duty, particularly during busy times.